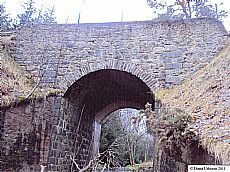 This bridge from Tomatin is one of over 1,000 bridges Thomas Telford built in the Highlands in the early 1800s. The impact of Thomas Telford (1757-1834) in the Highlands was enormous. He laid the basis of a comprehensive transportation network, with over 1,200 miles of new roads (many of them requiring bridges). A number of bridges, sections of road, milestones and toll houses still survive throughout the Highlands. In addition, he built canals, from the justifiably famous Caledonian Canal to the lesser known Dingwall canal (see site of the month November 2010 ). Many harbours and piers were built or upgraded to improve transport for ferries or improvements needed for fishing. Telford’s activities were not only concerned with transport, however. He built churches and manses (see site of the month November 2012) and even towns (Pultneytown in Wick). Throughout his work Telford experimented with new ideas and techniques, and displayed exceptional management and overview of projects. The Highlands after his work was a very different place, with at long last the basis for transport between previously remote areas. Proceedings of the Institution of Civil Engineers vol 160, issue 5 (May 2007) and in particular Roland Paxton’s introduction pp. 3-6. Curtis, G.R. 1978-80. ‘Roads and Bridges in the Scottish Highlands: the route between Dunkeld and Inverness 1725-1925.’ Proceedings of the Society of Antiquaries of Scotland 110, pp. 475-96. The achievements of Thomas Telford will be highlighted in a public lecture to be given by Professor Roland Paxton on 27th May 2013 at Millburn Academy, Inverness. This is an opportunity to find out more about this extraordinary man and his impact in the Highlands. ARCH is also fundraising for a 3 year project to explore Telford’s work in the Highlands. If you would like to be kept informed, please contact the ARCH office.